Jerusalem — After several days of rushing and intense debates, Israeli Prime Minister Benjamin Netanyahu had his wish come true. He urgently wanted to get the Nation State bill passed into law before the Knesset goes into summer recess on July 22, and for several days now the Knesset committee charged with ironing out the bill was delaying the process with long discussions. Now the law passed 62 to 55 and 2 abstentions. 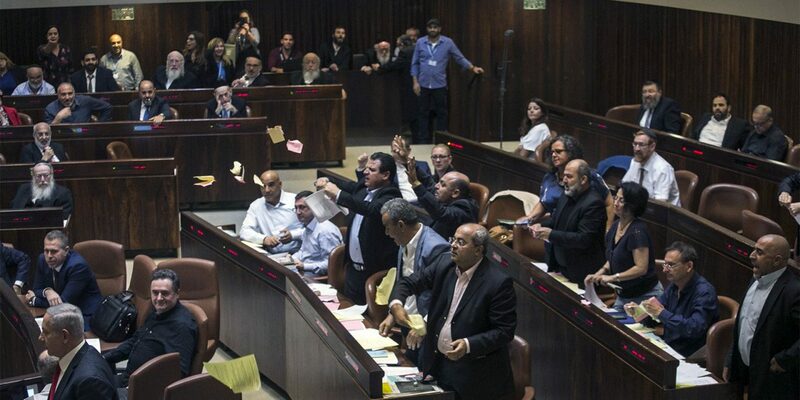 In an almost symbolic act of racism, the Palestinian members of the Knesset were kicked out of the chamber following the vote because of their vocal protests. Now, with the haggling and the opposition members’ delay tactics over, the final version of the bill has been approved by the Knesset. This law, which has been described as the legislative “Flagship” of the current government, is officially named “Basic Law – Israel as The Nation State of the Jewish People” has become one of Israel’s Basic Laws — laws that, in the absence of a Constitution, have constitutional standing. This law has been discussed for several years now; it has evolved, however, and has become extreme to a degree that even right-wing politicians like Benny Begin, the son of former Prime Minister Menachem Begin, and former Likud Defense Minister Moshe Arens, who originally supported the bill, now oppose it. 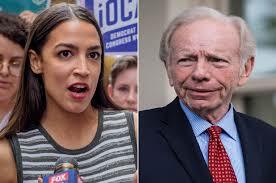 In the new version that was accepted by the committee today, the word “democratic” has been eliminated — arguably so that so-called Zionist values could take precedence over democratic values where the two may collide, particularly over issues pertaining to the Palestinian people. The Nation State law codifies what have been racist policies and practices by Israel into law, and not just a regular law but a Basic Law that defines the State. Dr. Yusef Jabarin, member of the Israeli Knesset for the Joint Arab List wrote to me that even though some elements of this law already exist within Israeli law, codifying it as a Basic Law gives the discrimination constitutional standing, which means it will be harder to challenge the racist policies in the courts. For example, since the State of Israel was established in 1948, over a thousand Jewish towns have been established throughout the country. At the same time, not only were close to 500 Palestinian towns and villages destroyed but in the last seven decades, not a single town has been established for the Palestinian citizens of the state, even though this community grew from a population of around 150,000 to close to 2 million within that same time frame. Palestinians are not welcome in Jewish towns and in many cases would prefer to remain within their communities. Still, for seven decades the State of Israel expropriated enormous tracts of land from Palestinian towns that were not destroyed. These lands were taken in order to build towns and communities, but almost exclusively for the Jewish citizens of the state. Some Jewish towns have instituted “acceptance committees” in order to make sure that no Arabs are permitted to reside in them, and the legality of these committees has been brought to question in the courts. This bill puts the issue to rest by giving a quasi-constitutional stamp of approval to these committees. It is interesting to note that the original version of the bill said: The State may allow a community, including followers of a single religion or members of a single nationality, to establish a separate communal settlement.” In other words, followers of any religion on nationality were given this right. That language was scrapped and replaced with the following: The state sees developing Jewish communities as a national value and will act to encourage, promote and establish them.” Clearly, they went from allowing segregated communities to encouraging, promoting and establishing segregated communities for Jewish citizens only. Furthermore, Jabareen writes, many of these towns have committees that are responsible for accepting or denying citizens seeking to live within them, thus preventing Palestinian citizens of Israel from moving in. The state of Israel is the sole owner of 93 percent of the land, and Israeli law prevents it from selling or leasing to non-Jews. Arabs citizens of the state, who are the native citizens of the land and make up over 20 percent of the citizens, or close to 2 million people, own 2.1 percent of the land. In 1922, when the League of Nations handed over Palestine to the British Government as a Mandate, it stated specifically in Article 22: English, Arabic and Hebrew shall be the official languages of Palestine. Any statement or inscription in Arabic on stamps or money in Palestine shall be repeated in Hebrew and any statement or inscription in Hebrew shall be repeated in Arabic.” This has been the law of the land since that day. The status of Arabic began eroding once the State of Israel was established and state institutions almost completely disregarded Arabic so that Hebrew became the dominant language. Still, Arabic retained its legal status as an official language and is spoken within the Palestinian towns where, unlike the Jewish citizens of the state, the residents speak both Arabic and Hebrew. The Nation State bill demotes the status of the Arabic language and states: Hebrew is the language of the country. The Arabic language has special status in the country. Its speakers have the right of [Arabic] language access to the services of the state.” This will erode the Arabic language even more and because this is now within a Basic Law, there will be little or no legal recourse for the Arabic speaking community seeking to challenge it. The parts of the law mentioned above are only the more controversial within the bill, but its entire essence is a dangerous attempt to give constitutional status to the erasure of all Arab and Palestinian characteristics from a country that until 70 years ago was known as Palestine and that, in the minds and hearts of millions around the world, remains Palestine. The right to exercise national self-determination in the State of Israel is unique to the Jewish people.” One has to wonder what Palestinians who have lived on this land for centuries, not to say millennia, must think when they read that they have no right to exercise self-determination on that land. What the bill does not show is that in the minds of its authors and supporters, the boundaries of the State of Israel are not the UN-sanctioned 1947 boundaries and not the pre-1967 boundaries. The Israeli government and all members of the coalition, and indeed many members of the opposition see the boundaries of the State as all of historic Palestine, from the River Jordan to the Mediterranean Sea. The bill gives no answer as to the status and rights of the Palestinians who are not citizens of Israel. The Nation State bill claims that the entire unified Jerusalem is the capital of Israel. This is once again giving constitutional status to what is a violation of UN resolution 181 and international law, which call for the city to be an entity on its own and not part of any state. The status of the Palestinians in the city is tenuous and precarious. In 1948 every Palestinian was forced to leave West Jerusalem and since 1967 there is a campaign of forced exile that is gaining momentum by the day. This law will no doubt make things even more difficult as the state expropriates land, homes, and neighborhoods from the Palestinians to build for Jews. 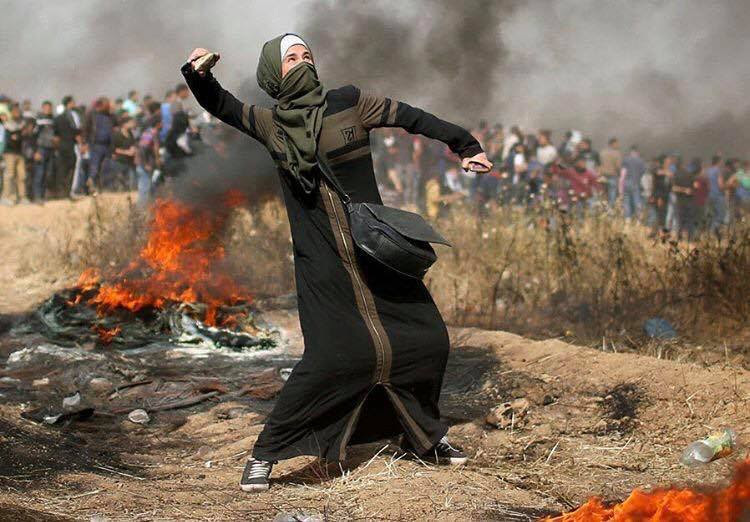 This must be seen within the context of the Palestinian demand to execute their right to return to their land and their homes. It is made clear here that the state will be open to Jewish immigration only, which was the practice and now is codified in Basic Law. One may argue that the State of Israel has once again made the case in support of the call to impose boycott, divestment, and sanctions (BDS) on the State of Israel. In a matter of a few short weeks, Israel has bombed Gaza, destroyed the small village of Khan Al-Ahmar, and has now passed a law that makes it an official apartheid state.